Curious Ostrich » Blog Archive » More Awards! 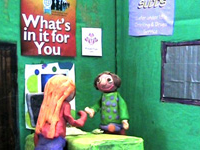 The Hawthorn Project’s animated film ‘Staying Safe’ has been shortlisted for two major national awards. This year marks the sixth Children & Young People Now Awards. The awards were created to share and celebrate best practice for all those who work to improve the lives of children, young people and families. ‘Saying Safe’ is nominated for the the rather apt category ‘The Stay Safe Award’. The screening will take place on Thursday 17 November in Hammersmith, west London. This year marks the sixth Children & Young People Now Awards. The awards were created to share and celebrate best practice for all those who work to improve the lives of children, young people and families. ’Saying Safe’ is nominated for the the rather apt category ‘The Stay Safe Award’. The screening will take place on Thursday 17 November in Hammersmith, West London. Oska Bright run the world’s first film festival run by, and for, people with a learning disability. Screening will take place at Brighton Dome’s Corn Exchange, Church Street, Brighton from 22nd – 24th November . Oska Bright Film Festival screenings will also be shown as part of The Outsiders Festival in Adelaide, Australia. The Outsiders Festival will happen at the same time as the Oska Bright Film Festival.